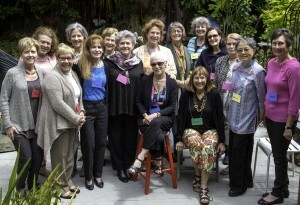 At Sharonjean Moser Leeds’ house in San Francisco for the mini-reunion: Seated from left – Sharonjean, Merle Goldstone. 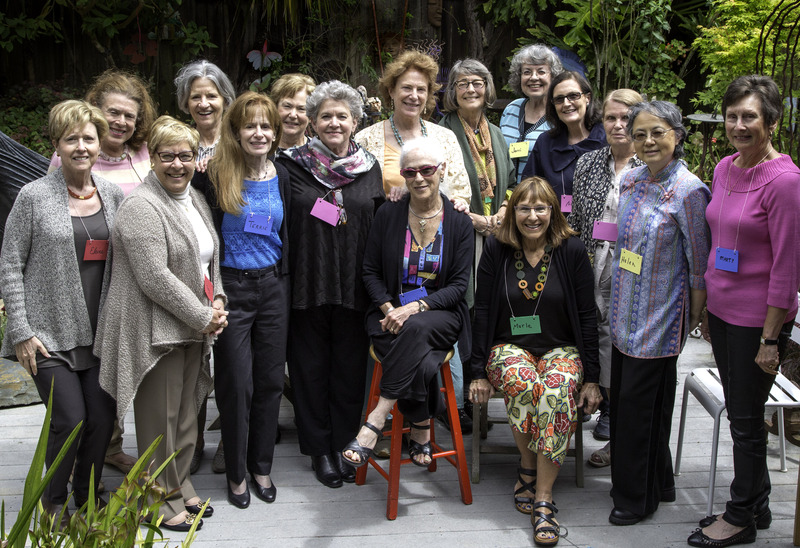 Standing from left – Elaine Sussman Belvin, Carlyn Koch Steiner, Judy Brown Kleinman, Margaret Von Blon Wurtele, Terrie Gale, Susie Bernat Rosenbaum, Ellen Kipnis Kanner, Frances Allen, Peggy Printz, Jerri Pantages Long, Paula Barker Duffy, Paula Gardiner Roberts, Helen Hui, Martha Stevens Coddington. 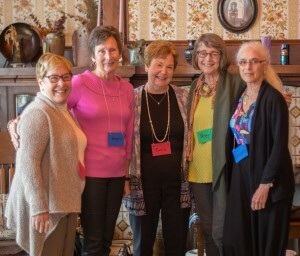 Our class mini-reunion in San Francisco May 1-2 was a chance to renew acquaintances and friendships, and to make new ones. It was a splendid time, especially for those who love to eat and talk. Class officers from around the country were joined by Jerri Pantages Long, Peggy Printz, Sharonjean Moser Leeds, Mary Morgan, Marty Stevens Coddington, Helen Hui, Francie Allen, and Merle Goldstone. Friday’s dinner was an Italian feast. 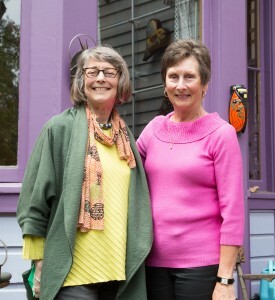 Then Saturday morning, the class officers met at Sharonjean’s beautiful art-filled home where we had a productive meeting planning our 50th reunion, coming mini-reunions in Boston and New York City, and other activities between now and the 50th. Reunion chairs Ellen and Polly introduced our new logo and the theme Becoming Women Becoming Wise. Classmates joined us for an al fresco lunch at Sharonjean’s house, and after lunch we talked more about reunion hopes and plans. Francie Allen suggested we talk about three personal questions: (1) What are the particular challenges in my life right now? (2) What are my particular joys, or what am I particularly proud of? (3) What difficulties am I facing in my life right now and what have I learned that will stand me in good stead? Although some were skeptical, these questions led to an eye-opening and intimate hour together. Starting with our shared Smith experiences of 50 years ago, we talked about thoughts, challenges, hopes, and fears about the future, and found that many of us share the same concerns. 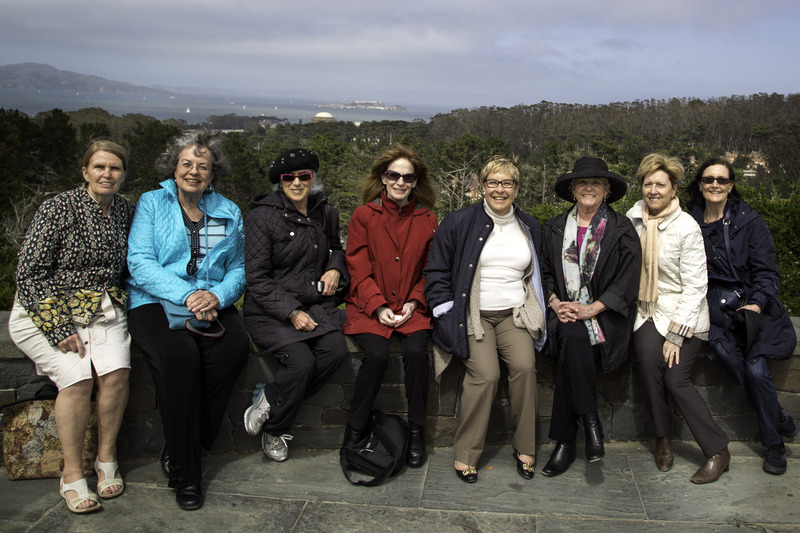 We continued our conversations as we walked through the beautiful nearby Presidio, and shared a Chinese feast for dinner.